Learning Goal 7k. Identify different snow crystal habits by sight. Learning Goal 7l. Give reasons why snow crystal habits form differently. Snow that has fallen on the ground is made up of many small crystals of ice. These crystals take on many different shapes or habits, and usually measure just a few millimetres across. However, the largest single snow crystal ever actually photographed was 10.1 mm (Fig. 7kl.1). Fig. 7kl.1 - The largest single snow crystal ever photographed, 10.1 mm from tip to tip (Credit: Libbrecht). ...and diamond dust, the smallest snow crystals that glisten in the sun, usually found in extreme cold weather. Why do we care about snow crystal habit? 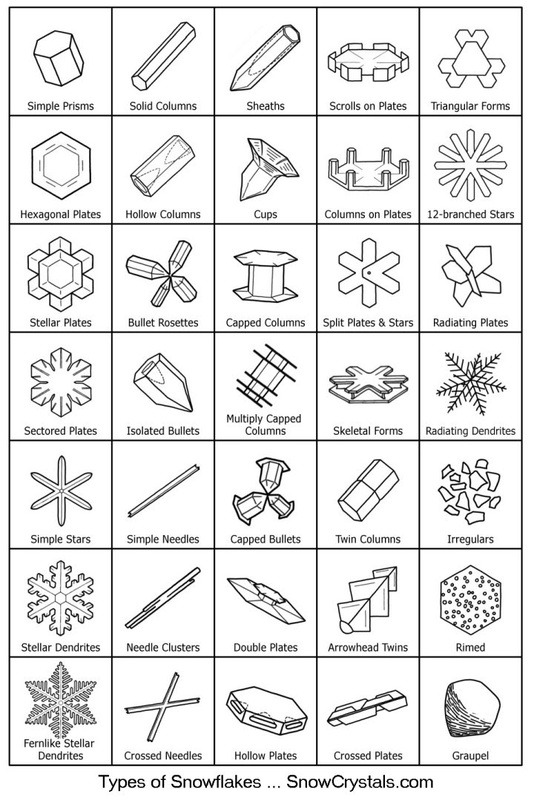 Aside from being beautiful to look at, it is helpful to know about the shape of snowflakes as this affects the density of the snowpack on the ground (see Learning Goal 7b). This is important in the context of avalanches as different snow crystal shapes create layers of snow with different densities. This is covered more in detail in Learning Goal 7f. As temperature decreases below 0°C, from left to right in the figure, snow crystal formation changes type three times. From flat plates, to long columns or needles, back to plates again, and then to columns and plates. As humidity increases, the snow crystals tend to get bigger. Also, they tend to get more branches or dendrites on them. The diagram just provides a visual aid to help you remember this. The snow crystal photographs above are from Kenneth Libbrecht's Guide to Snowflakes. 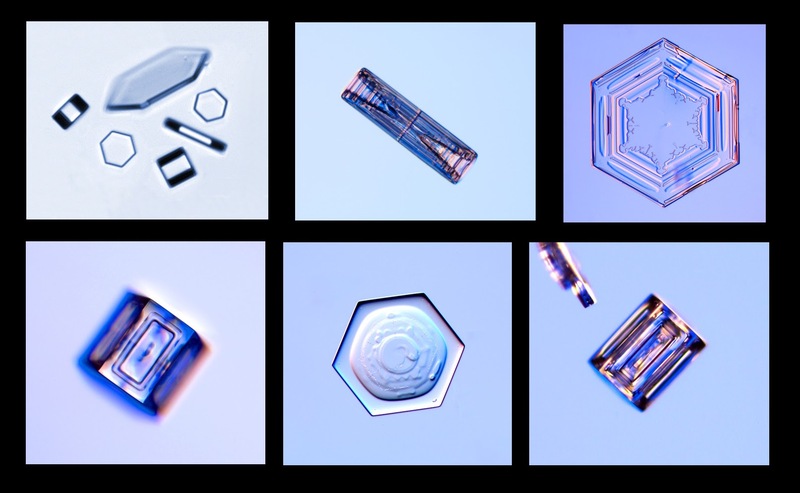 Dr. Libbrecht is a professor at California Institute of Technology and has studied snow crystals in great detail, even growing them himself in his laboratory. You might be wondering how some of the weirder shapes are formed. Temperature and humidity can change a lot along the path of a falling snow crystal. This path may extend from near the top of the troposphere to the ground. As an example, maybe a snow crystal falls for a short time through a layer of air at about -15°C; according to Fig. 7kl.5, the crystal will grow outwards into a small flat plate. The next layer of air that the snowflake passes through is warmer at about -7°C. The crystal begins to grow in the direction perpendicular to the flat plate, creating a solid prism. The next layer of air is colder again, at -13°C, and so the ends of the prism begin to grow outwards in the other direction, the same direction as the original plate. This is how a capped column is formed, which looks like two wheels at each end of an axle (Fig. 7kl.3). And that is just one example. If you can imagine the endless possible combinations of temperature and humidity, then you will start to grasp the infinite possibilities of snow crystal shape and size. For a more in depth discussion on the science of snowflakes, see the link and YouTube video in the Xinfo section below. So far we have essentially covered plate-shaped and column-shaped snowflakes. There are two other processes that can occur which can be important. 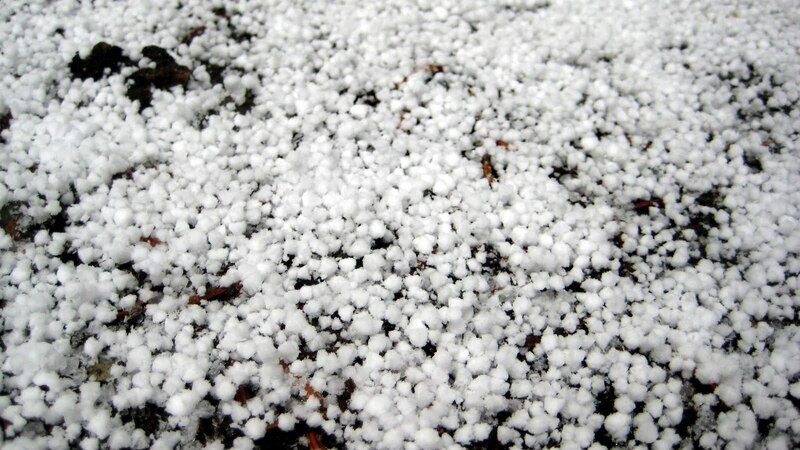 The new snow crystals that form are called graupel. They look like rounded but rough white ice pellets (Fig. 7kl.7). They are round and frozen and look like hail, but hail tends to be clearer and forms by a very different process (in thunderstorms, usually in the warm season). Graupel on the ground is unstable on slopes — they tend to roll downhill like marbles — and thicker layers can form a weak layer, presenting a risk of avalanches (see Learning Goal 7f). Fig. 7kl.7 - Graupel on the ground at Peyto Lake, AB, Canada (Credit: West). 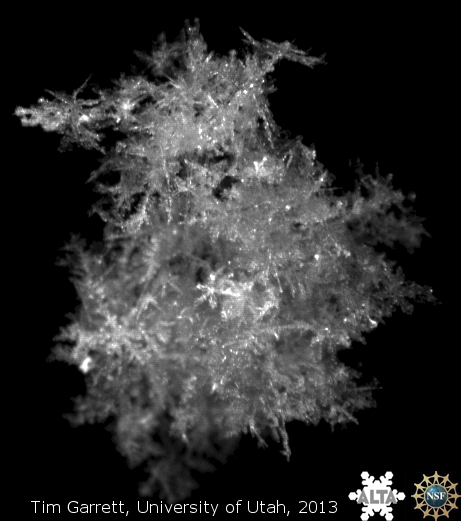 A snow crystal can also grow by aggregation. This is when ice crystals stick to other ice crystals, forming irregular shapes referred to as "aggregates" (Fig. 7kl.8). Extra Info for Experts; Not Needed for this Course. 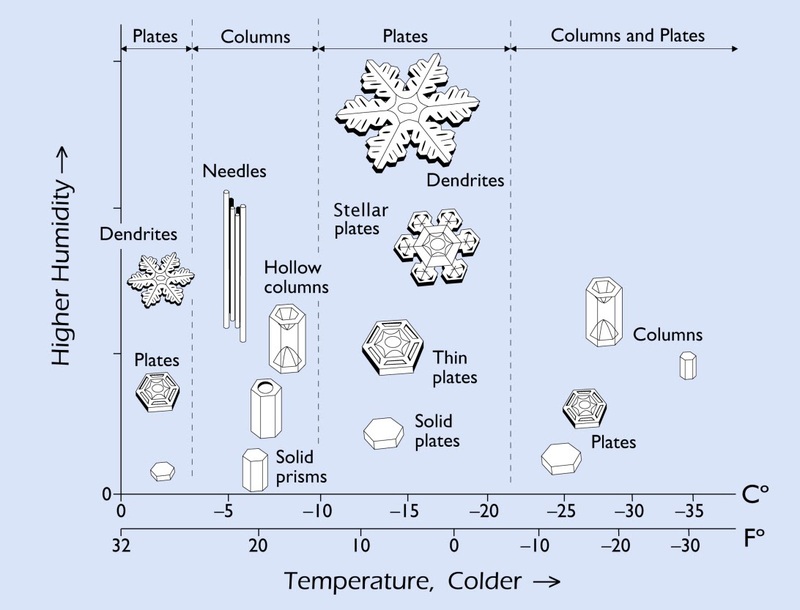 Link to the section of Kenneth Libbrecht's website on the science of snowflakes. 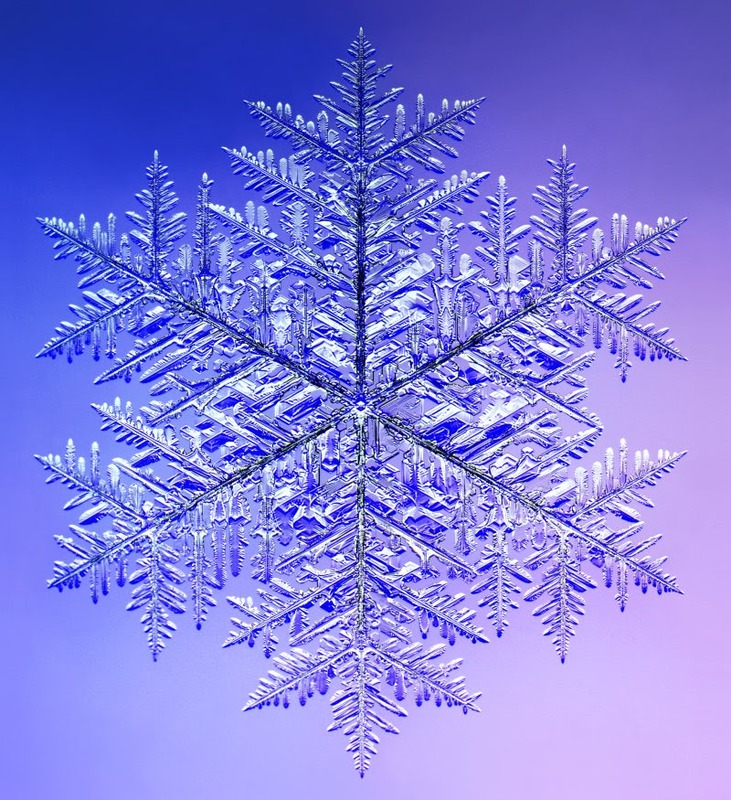 Watch this video on The Science of Snowflakes for a more detailed description of how snow crystals and snowflakes are formed, among with other interesting snow information. COMET/UCAR: The source of this material is the COMET® Website at http://meted.ucar.edu/ of the University Corporation for Atmospheric Research (UCAR), sponsored in part through cooperative agreement(s) with the National Oceanic and Atmospheric Administration (NOAA), U.S. Department of Commerce (DOC). ©1997-2016 University Corporation for Atmospheric Research. All Rights Reserved. UBC ATSC 113 - Weather for Sailing, Flying & Snow Sports. Copyright © 2016-2019 by Greg West and Rosie Howard.